My sister sent me a link to the Amazon Kindle that sparked my interest. It’s a lightweight $400 ebook reader – a specialized tablet PC with a wireless connection so you can download e-texts from Amazon. It sold out in five and a half hours according to Slashdot. I’ve been looking at the minimalist Linux based based notebooks apparently spawned by the OLPC (One Laptop Per Child) initiative. Palm was going to bring out the very elegant looking Foleo for $500 but withdrew it at the last minute. 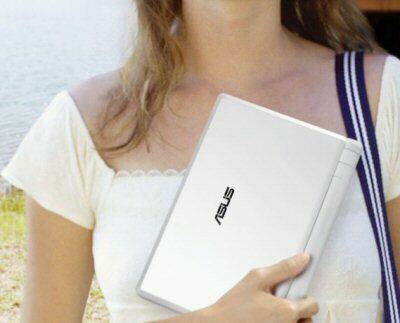 Asus has shipped its eee PC at $400. (Asus is only selling them to bulk purchasers like Education Departments here in Australia but they are available retail in the US now and on Ebay). Here is picture that really shows that we are dealing with a new form factor. I think we are crossing a technological threshold because of the intersection of smaller cheaper parts, anywhere wireless broadband, and affordable flash memory. High contrast ‘digital ink’ screens that only use power when you flip the page are a big help too. This kind of leap in the usability of computer technology is always exciting. I remember well how badly I wanted computers to do word processing in the seventies. Now I want an ebook reader so I can read electronic text in comfort and also search the text on my computer and then cut and paste quotations. I’ve actually considered scanning and running an OCR (optical character recognition) program on a couple of books I use all the time for Newmediatheory.net just so I can electronically search and quote them. Then there is all the older titles you can download from Project Gutenberg. If you have a Palm device or a smartphone and want try reading electronic books you can download ebooks in a special small screen format from Project Gutenberg that uses a free reader program called Plucker. I’d give that a try if I had a phone with a generous screen. I do have an MP3 player and use it to listen to free audiobooks from Librivox.org. Classics from Wuthering Heights to Sun Tzu’s Art of War. Your public library probably subscribes to an audiobook service – mine does here in Perth – that provides more up to date material. 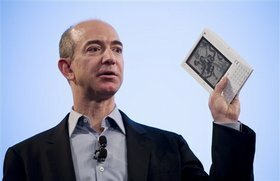 If Amazon had any substantial number of Kindles in stock it looks like we are going to see a lot of ebook readers very soon. Yankeewombat may end up with more than one.